This book chronicles the difficult period of loss of home and livelihood in the city through urban eviction, encounters with the agencies of the state, love stories gone awry, the fragility of relationships, and the sustained effort to build life in anticipation of beauty and pleasure. 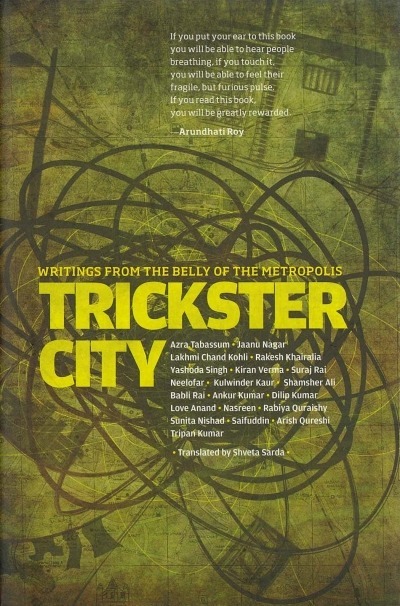 Trickster City is an aphoristic and playful meander by authors in search of a new language that expresses the profound uncertainties and delicately realised joys of life in the city. The authors draw from experiences, events and biographies, part fictive, part documentary, to inscribe an image of the city that is rarely available. There is a yearning in their writings for the expression of the poetic and allegorical alongside the harshness of everyday existence. All the authors are in their twenties, and live in neighbourhoods across the city, including LNJP colony in Central Delhi, Dakshinpuri in South Delhi and Sawda-Ghevra, a new resettlement colony at the northern frontier of the city. They have been associated for different durations with the Cybermohalla labs set by up Ankur Society for Alternatives in Education and Sarai–CSDS in different neighbourhoods in Delhi. Authors: Azra Tabassum, Jaanu Nagar, Lakhmi Chand Kohli, Rakesh Khairalia, Yashoda Singh, Kiran Verma, Suraj Rai, Neelofar, Kulwinder Kaur, Shamsher Ali, Babli Rai, Ankur Kumar, Dilip Kumar, Love Anand, Nasreen, Rabiya Quraishy, Sunita Nishad, Saifuddin, Arish Qureshi, and Tripan Kumar. Published by Penguin Books India.